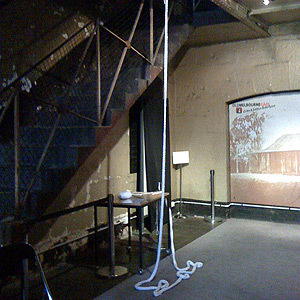 Cold Comfort was a participatory work installed in the Old Melbourne Gaol in Sept-Oct, 2012. The piece was 6 feet of knitted work, sewn to a metal bar at one end and attached to the knitting loom at the other. Placed beside it was instructions inviting people to knit a few rows themselves. The placement in the gaol was directly across from the gallows (where the rope still hangs from a cross beam) and Cold Comfort directly mirrored this. The work was an attempt to inject some warmth and humanity into the cold, solid gaol. As the piece developed, it introduced growth and movement into a place devoid of life and hope. Cold Comfort references care packages sent to prisoners and refugees while the act of knitting itself creates a bridge between the participants and each other, between the participants and those who lived and worked in this place. Labour intensive repetitive tasks were often given to prisoners to break their spirit and wear them down, with Cold Comfort I instead wished to provide a calm, gentle task to allow for space for contemplation. Your blog is fantastic. I love this project and basically everything you’re working on. So good. Thanks so much for that! Feedback like that is always awesome to receive.